These project templates for ASP.NET MVC versions 3, 4, and 5 get you started with MVC development by quickly configuring the project with ASP.NET MVC resources. 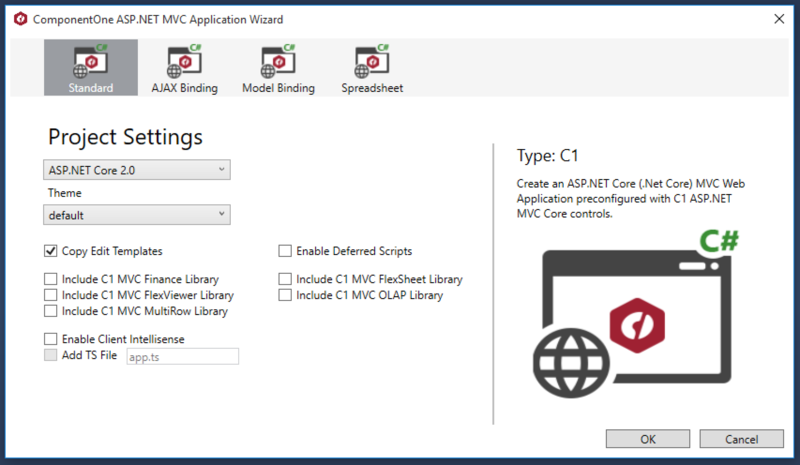 The templates configure the project with ASP.NET MVC resources by integrating required ComponentOne libraries and themes, resource registering, and license configurations. Spreadsheet: Create a C1 ASP.NET MVC business application with spreadsheet. Enhanced EditorTemplates in the MVC Project Templates turn EditorFor helpers into rich editors. Render a basic DateTime field as an InputDate control with a pop-up calendar, giving your users a rich experience. These project templates can create a standard ASP.NET MVC version 3, 4, or 5, project — as well as an ASP.NET Core project — that automatically adds references based on the choices you made in the project wizard, adds licenses, and registers resources. These projects can also enable Razor IntelliSense for ASP.NET MVC controls.